Brontosaurus  is a genus of sauropod dinosaur. Brontosaurus was originally named by its discoverer Othniel Charles Marsh in 1879. Brontosaurus had long been considered a junior synonym of Apatosaurus. Its only species was reclassified as A. excelsus in 1903. However, an extensive study published in 2015 concluded that Brontosaurus was a valid genus of sauropod distinct from Apatosaurus. Brontosaurus is a member of the family Diplodocidae, a clade of gigantic sauropod dinosaurs. The family includes some of the longest creatures ever to walk the earth, including Diplodocus, Supersaurus, and Barosaurus. 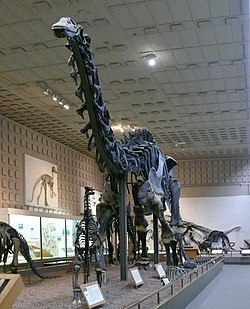 Brontosaurus is closely related to Apatosaurus in the subfamily Apatosaurinae. This page was last changed on 28 July 2018, at 21:54.